Traveler Ratings for Private Tour in Mexico City, Distrito Federal, Mexico by Tour Guide Karina L.
Karina is an AMAZING tour guide! We were traveling with our two children ages 7 and 9. She was fabulous with our kids, and helped them really learn and have fun on our tours. Karina is so kind and just a pleasure to be around. We so highly recommend her! Karina was really helpful and knowledgeable. When my flight was delayed we adapted the tour to ensure I still managed to see the archaeological sites. We even stopped to taste an interesting snack on the way back. The car was really comfortable and clean and the driver very good. FABULOUS. We had a great time with Karina. Her knowledge of history and culture were impressive, but her human side, her connection to our needs and wants where phenomenal. She customized the tour to exactly what we wanted. Excellent experience. We'll be back in Mexico and will definitely will seek her services again. What can one say about Karina? Incredibly personable, intelligent, friendly, knowledgeable and a ball of fun to be with. There was not one question we posed to Karina throughout our 4 customized tours that she did not have the answer to. You can see her eyes light up and the joy she gets from describing and sharing her beloved Mexico City. 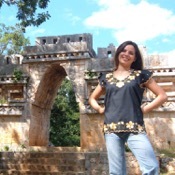 We can't wait to continue our discovery of Mexico again with Karina as our guide. We very much felt at home. What a fantastic tour. So much to take in so start early in the day. Breathtaking views and sense of the ancient history while during the climb and after the climb once atop the Pyramid of the Sun. The museum is essential before the tour of the grounds to better appreciate the profound history of the site. Excellent tour with an amazing guide. Thank you - highly recommended. Karina was AMAZING. She arrived on time in a vehicle that could easily fit our family. She was extremely knowledgeable about the entire area and was a great tour guide. She was also very accommodating - even making sure if we ordered something or bought something, that we were getting a fair price. I would highly recommend her for any tour. Everything was exactly as expected and then some. Karina was so incredibly kind and knowledgeable. She took my husband to every place he wanted to see, modified her usual itinerary to take into account our children, and truly made us feel completely comfortable. Even my shy 1 year old loved her. We couldn't be happier with our tour. Karina Lazcano, our guide, was kind, considerate, patient and knowledgeable about Mexico City and the Teotihuacan ruins. She made certain that our group could visit the site and learn of the ancient inhabitants. She took time (I do not walk well) to be sure that our group visited the entire site. We had lunch at a special place, the Grotto. Karina, thank you so very much for a very special time. Karina was such a lovely tour guide. Incredibly patient and enthusiastically answered our million and one questions. Never felt like she was rushing us thru any of the tour, always ok to go by our pace. She always had a pleasant disposition and showed true interest and care for the work she does and for Mexico. Would definitely recommend her to anyone interested in getting a local tour. Nous avons reserve une visite avec Karina pour Teotihuacan et Tula. Elle est arrives a l'heure prevue a notre hotel en companie d'un chauffeur. Le qualite du vehicule etait exellente, nous etions tres comfortable. De plus le chauffeur a conduit de facon tres securitaire. Karina est tres amiable et connait tres bien les sites que nous avons visites. Elle nous a accompagnee tout le long de notre peripriple meme sur la pyramide du soleil. Elle a tres genereuse de son temps. Nous la recommendons fortement. Karina was on time at the hotel and throughout the tour she was knowledgeable and entertaining. Karina is a lovely, gentle soul with a great passion for her country and an excellent depth of knowledge. She s ready to answer questions and share as much information as one can take in. The car she used was very comfortable with a great driver. Karina was very personable and the tour of the pyramids and region was very informative and enjoyable. I highly recommend her as your guide! A wonderful tour with a wonderful guide. Thank you. We were picked up on time at the airport in a comfortable vehicle with a very capable driver given the busy road conditions of Mexico City. The tour of Teotiachuan was good and included a little visited museum housing artifacts from the site. The lunch at La Gruta was tasty and it is a very unique cave location. We also had a nice tour of the major sites of Mexico City. We were picked up on time in a nice car, our tour guide Karina gave us info on Teotihuacan on the car ride there. It was a beautiful morning sunny with a cool wind blowing, the site was more amazing than all the photos I have seen. Karina gave us fantastic well paced tour of the huge complex. She pointed out many details we would have missed. Her knowledge completed the picture of the people's life in the city. The walk in the garden and museum was awesome. We topped it off with lunch in a cave. TOUR GUIDE RESPONSE: Thank you very much for your feedback, Mr. Edward. It was a pleasure and very enriching being your tour guide. We had an excellent visit to Teotihuacan with Karina, who was the perfect guide. She was friendly, chatty, perfectly fluent in English, and full of interesting information about Teotihuacan and Mexican life. Pick up was prompt and the car - ably driven by Arturo - was large and clean with good aircon. Karina also made a great restaurant suggestion for lunch. I would definitely book her again if I get the chance.